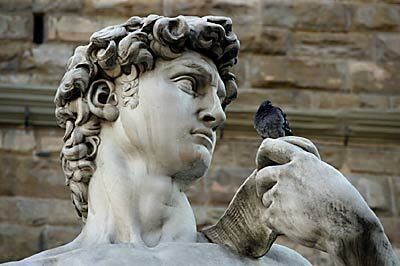 First of two essential half day tours of Florence with pre booked timed entrance to Academy. Must do tour for first time visitors in Florence with limited time. Renaissance Florence is laid before you. You begin at the world's third largest church, Santa Maria del Fiore (Duomo) to view Brunelleschi's magnificent Dome, Giotto's Campanile (bell tower) and Ghilberti's Baptistry Door, "Gate of Paradise". The next stop is The Academy and Michelangelo's "David"; perhaps the greatest sculpture ever created. From here it is a short walk to the Medici Palace where the family constructed and ruled the Golden Age of Renaissance Florence. This area includes the family church (San Lorenzo), Medici tombs and the Laurentine Library, home to a grand stairway created by Florentine favorite son and master, Michelangelo. Pre-booked tickets, special entrances and art overviews (all provided by your Lecture-Guide) make this first glimpse of Florence a comprehensive overview and an intense temptation to explore the bountiful treasures yet to be seen.